This recipe is a winner. I have witnesses. And it’s pretty darn easy to make, too, so that’s an added bonus. AND they’re beautiful. I got this idea after I made some roasted jalapeno poppers with a boatload of jalapeno peppers I got with our CSA share a few weeks ago. I changed up some of the cheeses in the recipe, using feta (very good choice), roasted garlic cheddar, and mozzarella. Then I added about 1/2 teaspoon of ground cumin to the cheese mix. I did not use cilantro. That’s about all the changes I made to the recipe. They were so good and I was sad to see the last one disappear. Fortunately, I had quite a bit of the cheese mixture left over that left me wondering how I was going to use it up. 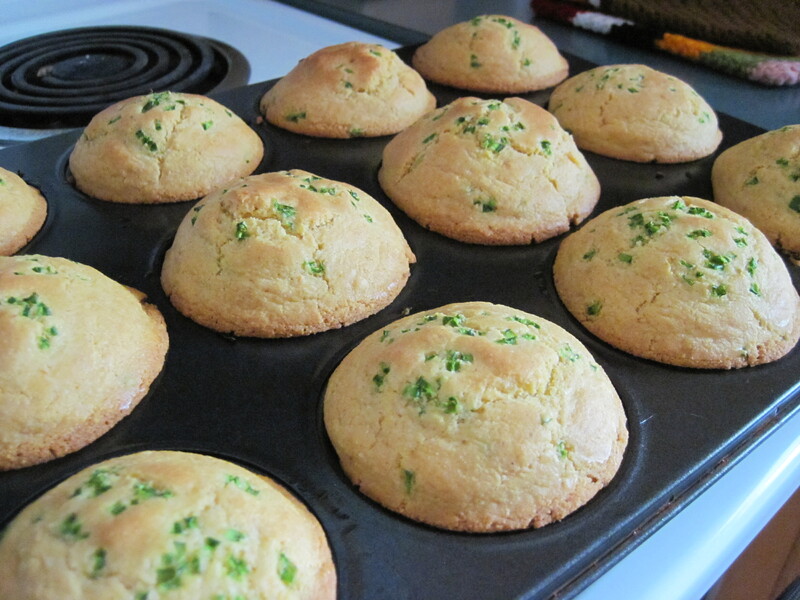 I also had lots and lots of jalapeno slivers left over, which got me thinking about jalapeno cornbread muffins. And then I thought, “Why not stuff the cheese mixture inside the muffin?” And that’s exactly what I did. I was so proud of myself for this one that I allowed myself to eat about 5 muffins for second breakfast/lunch. If I were to do anything differently, I would have added more jalapeno peppers to the cornbread mix and the cheese mixture. The muffins very flavorful, but not as spicy as the jalapeno poppers. 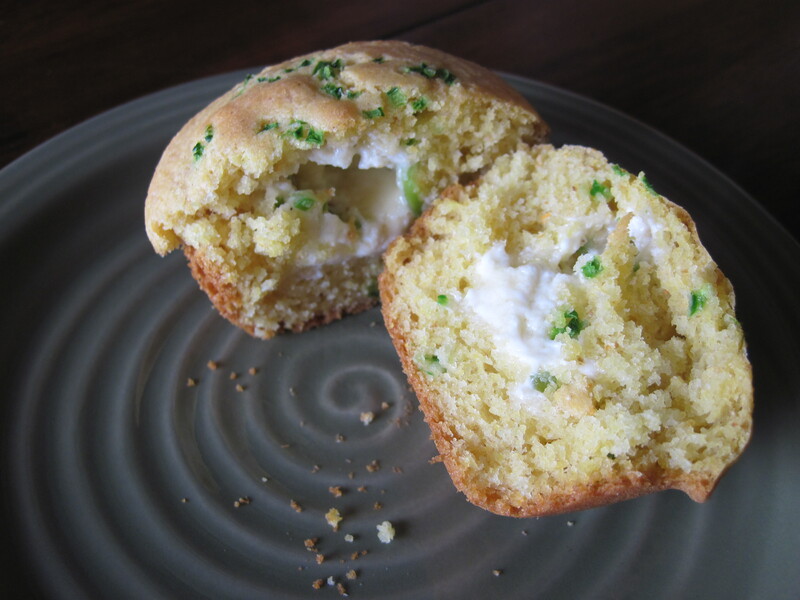 One of my friends who does not like spicy food was hesitant to taste the muffin, but she really liked it. So adjust the level of heat to your own taste. I make my own cornbread mix, but you can just as easily use a pre-packaged mix–just prepare it as directed on the package. Mix all ingredients together in a medium bowl until well combined. Take about 1 1/2 tablespoons of mixture and roll into a ball. Set aside 12 balls. There will be plenty of cheese mixture left over for another use. 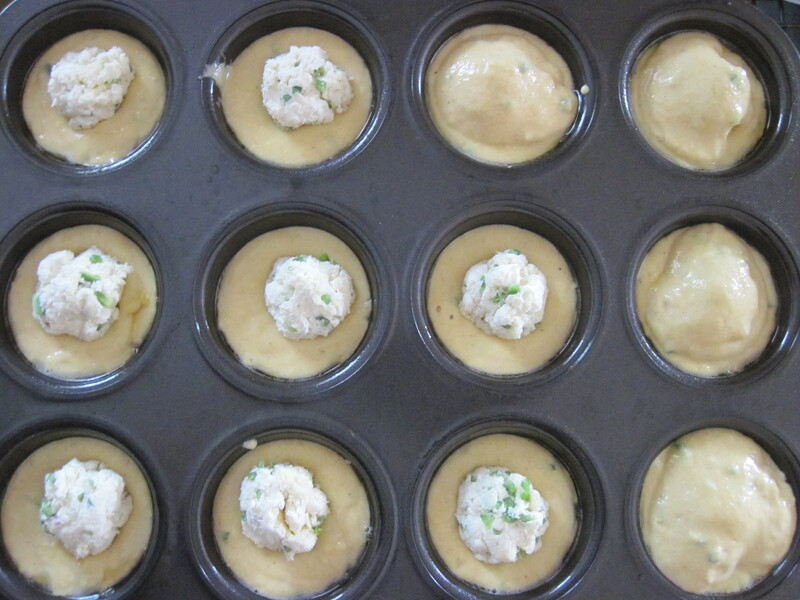 Preheat oven to 375 degrees F. Line a muffin tin with muffin liners or spray with non-stick spray. The muffin tins will be nearly full. Sprinkle the tops of each muffin well with the remaining diced jalapeno. Bake at 375 degrees F for about 20-25 minutes, or until the muffins begin to turn golden. Cool for 5 minutes, then carefully remove each muffin to cool on a wire rack. Eat warm or let cool completely. This entry was posted in CSA, Food and tagged community supported agriculture, CSA, feta cheese, garlic cheddar cheese, jalapeno popper cornbread muffins, jalapeno poppers, jalapenos, mozzarella cheese. Bookmark the permalink.